Marianne Magnus and her work belong to the tradition of weaving represented by Anker Aurdal which has been significant in the development of modern textile art in Scandinavia. But few have mastered the possibilities of tapestry as completely as Marianne Magnus has done. 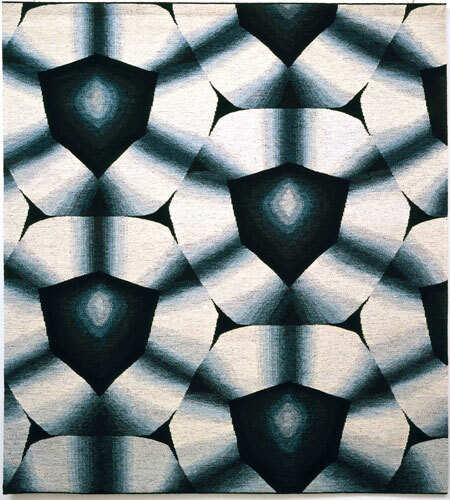 With consummate weaving skill the builts up the form of the work, creating an illusion of depth to its surface. The three dimensional effects are achieved both with precise shading and blending during weaving and the use of pre-dyed yarns. She has been influenced by architecture and russian textiles and ceramics from the 1930`s, with geometric patterns, and her works are carrying suggestions of steel webbing, fencing and metal meshes.